Opening your home up to complete strangers isn’t something most of us are accustomed to. However, hosting an open house is an important tool for finding a buyer. You’ve spent weeks prepping your home for the open house, but you’re not done yet. 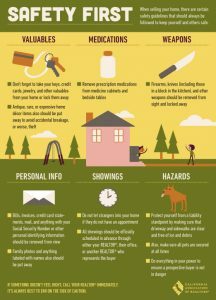 If you are still living in your home, there are some important steps you should take in order to ensure both you and your property remain safe. Valuables. We would like to trust everyone, but we can’t and it’s not possible for a real estate agent to keep an eye on every person in the home at all times. Thus, be sure to remove jewelry, credit cards, and other rare items from your home. Don’t worry so much about big items, but consider anything that could be stuffed into a bag. Medications. Remove all prescription medications from the medicine cabinet. The best idea is to keep them at a friend or relative’s home. Weapons. Always lock up firearms and weapons. Personal Info. Put away, or remove, all bills, invoices, and other mail or items with your full name. Remember that people will likely open cabinets, closets, and possibly even drawers. Showings. Only your realtor should be letting people in your home for a scheduled showing. Do not allow “drop ins”. Pets. Not only do your pets become stressed when strangers are in the home, but it can also be a liability if something were to happen. Selling your home is a stressful and exciting time. We want to help you make the process as easy and stress-free as possible. Do you have any safety tips to share? We’d love to hear them.